Post-MI pericarditis is inflammation of the pericardium, the sac-like covering of the heart. 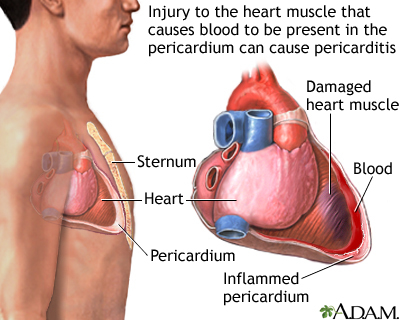 Any previous injury to the heart muscle can cause pericarditis. Incidences of pericarditis are associated with Dressler syndrome, after a heart attack, open heart surgery, and may also follow stab wounds to the heart or blunt chest trauma. Pain occurs when the inflamed pericardium rubs on the heart.